The season of Christmas is such a wonderful and magical time, from the pretty lights and decorations that seem to appear where ever you go, to the cheerful tunes that follow from stores and commercials on your television screen. 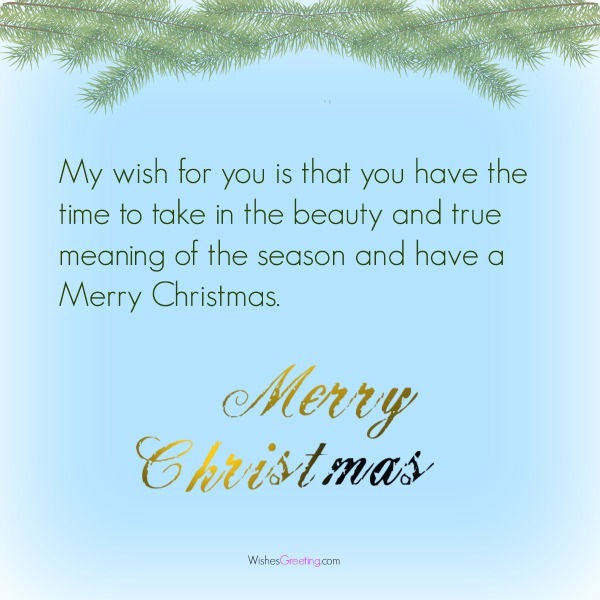 Here you can find some beautiful merry Christmas images with quotes that you can share with your friends, colleagues and family. It’s hard to avoid the joy that Christmas brings to the world. 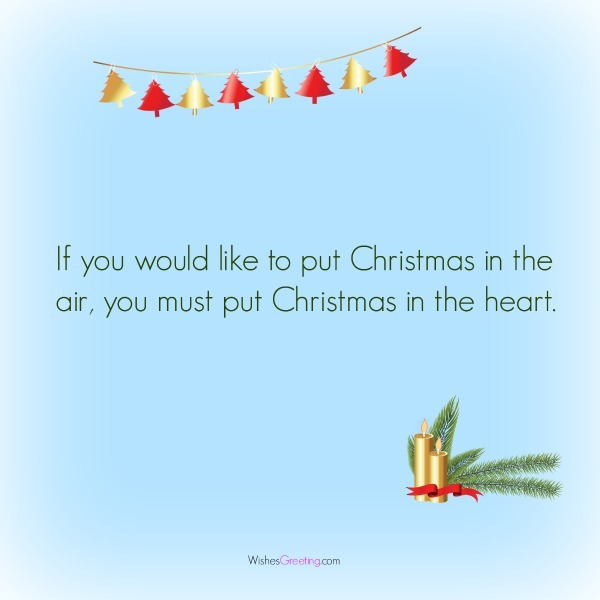 Reading some touching Christmas quotes will be sure to get your heart warmed up and ready for the season. Christmas is not about receiving. Christmas is about giving. May your heart be filled with the joy of giving. This is an expression of the love in your heart and the kindness in your soul. The holiday season can be such a busy time. It’s definitely easy to get lost in the flurry of activity during the holiday season. My wish for you is that you have the time to take in the beauty and true meaning of the season and have a Merry Christmas. The magic of Christmas is not in the presents but in the presence of Christ and in the presence of our loved ones. If your tree was filled with presents, but nobody to celebrate the holiday with, it probably wouldn’t be special. Don’t let beautifully wrapped packages get the best of you. The importance of the holiday isn’t in the gifts. Find joy in the people around your tree. Christmas is all about your state of mind. You can spend a lot of time decorating, buying gifts, writing out cards, and doing all kinds of things associated with Christmas, but if you don’t feel it in your heart, it will not be Christmas. Christmas is often a much more magical time in the minds of the youth. Many older folks are far too crushed by the disappointments, fears, and doubts of the adult world. 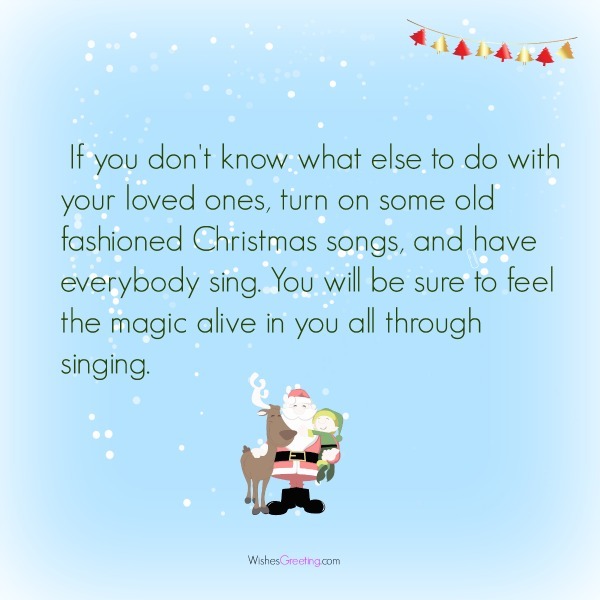 It is more difficult for adults to appreciate the magic in Christmas. As adults, we must strive to keep the magic alive in ourselves and in the environment around us. Rejoice in the phrase of the season, ‘Merry Christmas’. These two words against your lips will sound joyous and help you get into the spirit. In a Christmas state of mind, you learn to give, even if it’s just your hugs and smiles. There is a lot more to give than just gifts that can be wrapped. Some of the best gifts cannot be wrapped in a box. You can give hugs, kisses, smiles, time, a listening ear, advice, etc. Communicate with your loved ones because the lack of words and avoidance creates an unnecessary barrier. The funny thing is that so many of us fear confrontation, but confrontation gives us words we need to hear, hugs and love that we need to feel. Refuse to sit in a room consumed by technology. Talk about the topics you need to discuss. Truly appreciate time spent with loved ones. In December, it is important to remember that love weighs more than any material item, even gold. 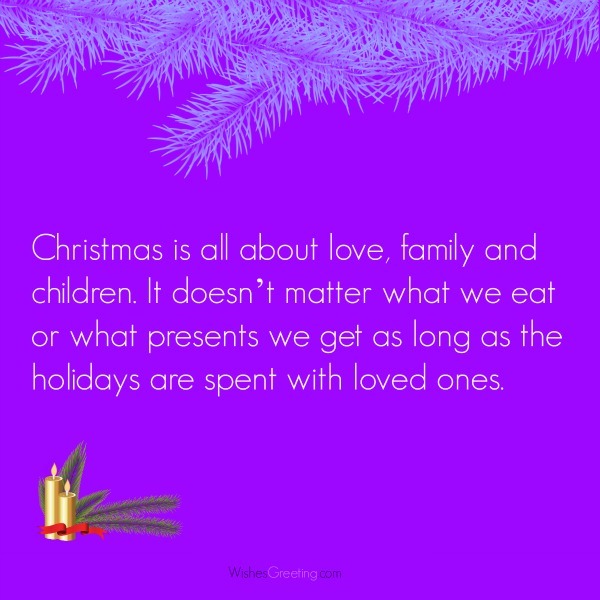 Christmas is all about love, family and children. It doesn’t matter what we eat or what presents we get as long as the holidays are spent with loved ones. All through out the year we should open our hearts to God and his gifts. This becomes so clear to all of us as we prepare for the birth of Jesus. 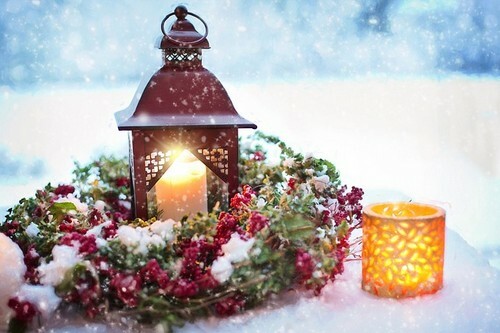 Christmas is a time in which the whole world is a little bit more beautiful. You can take a peak outside your window to see lovely bright decorations. Christmas is a time in which the whole world is a little bit more softer. People take a break from spending money for themselves, and they buy gifts for others. During the season of Christmas, learn to open your heart and find a wonderful feeling of kindness and generosity for others. Discover that when your heart is hard and closed, you are unhappy. There is so much potential to unlock underneath a closed heart. In allowing your heart to open up to others, you will find a happiness that you may have forgotten can live within you. We should strive to open ourselves to life and love in order to feel the joy of Spirit flow through us, thus we will be able to extend ourselves to one another. In this, we will cherish the delight of love and goodwill being returned to us. Approaching life with a giving spirit will cause love to come back to us. Sharing this experience creates a better world, a world in which care exists among individuals. 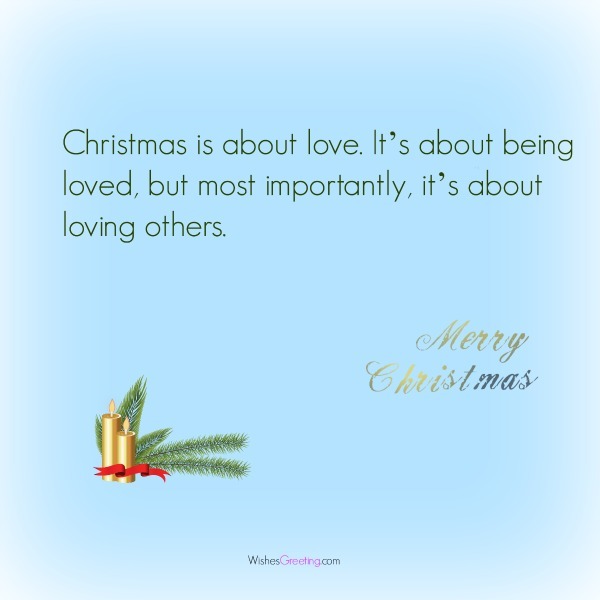 Share the Christmas joy with these amazing Christmas images with heartfelt quotes. Think of the Scrooge. Think of people you know who are like the Scrooge. And then remember this, even the most hardest of hearts can soften, and it truly is never too late to transform despair into hope. People can change overnight, sometimes quite literally. Christmas is about love. It’s about being loved, but most importantly, it’s about loving others. The moral of Christmas shall be that happiness has very little to do with wealth, as long as a person has enough to live on, he can be cheerful and contented. Greedy people will lose sight of the really important parts of human experience. 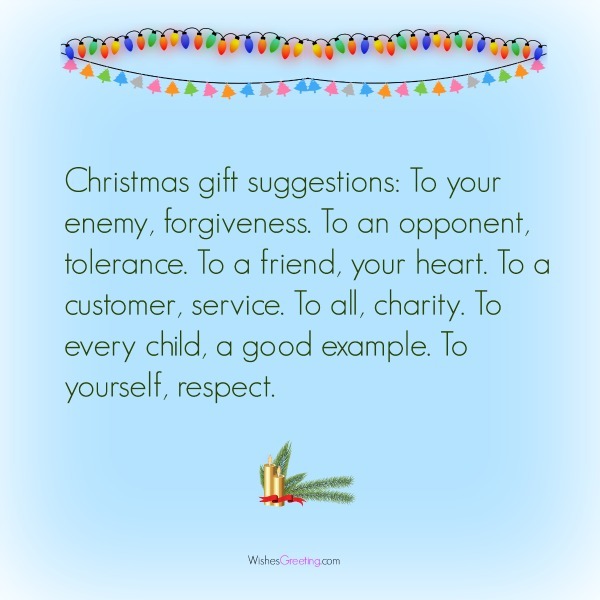 Christmas is such a wonderful season, but some people will lose sight of it’s true meaning, by trying to buy the best gifts and attempting to make sure they receive amazing gifts. Gifts are not the purpose of Christmas, but sometimes greed will make people think that it is. Christmas is not a time nor a season, but a state of mind. To cherish peace and goodwill, to be filled in mercy is to have the real spirit of Christmas. This world is chaotic sometimes. The people in this world are crazy. The inhabitants of this earth are not always the nicest creature. Yet, there is something about Christmas Eve that makes us all a little bit nicer than we normally are. Christmas is about the tradition. It’s about the one night of the year that even the adults in the world get a magical feeling in their heart. For the children, Christmas is about the magic of Santa. The magic of Christmas can live inside of adults, as well, but for those who are grown, it is often more about love. 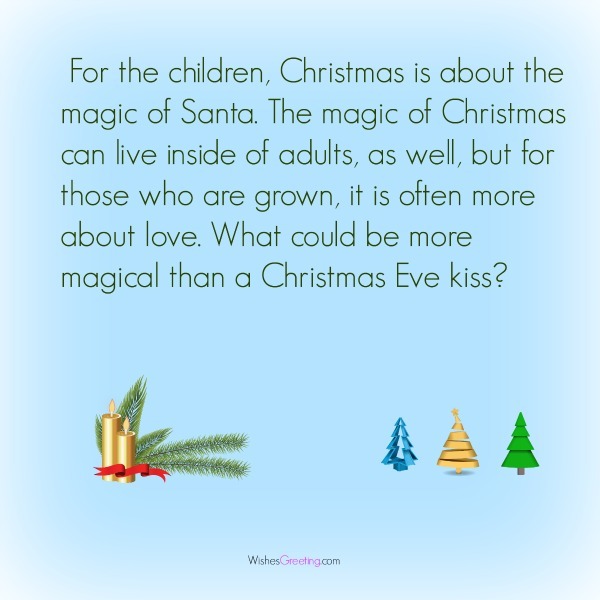 What could be more magical than a Christmas Eve kiss? In the minds of children it is simple to believe that there is a man named Santa Clause who travels across the whole world and brings all the good boys and girls presents. Children are untouched by the doubts of this world. It is easy for them to believe without seeing. Christmas day we celebrate for the birth of Christ. It is ironic when we think of where the holiday came from, but then we think of where we are now. Many places hang Christmas decorations, and many schools will still have holiday celebrations. However, there is little to no mention of the real reason behind the season. It is a mystery to imagine how the birth of someone so special and so amazing could have occurred. In life, sometimes it is better to not question things we wish we knew the answers to. Somethings are too special to question and the birth of Jesus is one of them. How it happened, we don’t really know. But, if it were not for Jesus, we would not be able to celebrate such a wonderful time of the year. Being uncertain is definitely worth the price. 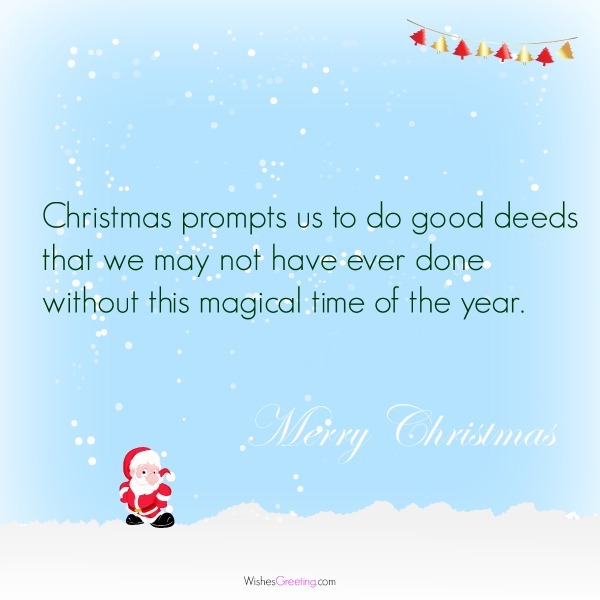 Christmas prompts us to do good deeds that we may not have ever done without this magical time of the year.